The Republicans did not hurry to react to the statement of the ex-minister of defense of Artsakh Samvel Babayan with the same zeal they respond to Nikol Pashinyan’s every single meeting or word related to Artsakh. Meanwhile, Samvel Babayan had alleged that in 2017 Serzh Sargsyan visited Artsakh and let the government and public know that concessions were needed. Samvel Babayan brought up the issue why the government of Artsakh did not speak then. Babayan said the Artsakh issue was one of the reasons for his arrest ahead of the 2017 parliamentary election. Of course, the government of Artsakh could have asked the same question to Samvel Babayan why he did not speak then. Moreover, for a long time after his arrest Babayan refused to admit his arrest had a political reason. When did he realize that one of the reasons was Artsakh? Didn’t he know then? Or, when he learned about Serzh Sargsyan’s cameral meeting, why didn’t he announce earlier? He could have done it through the ORO alliance, the political unit which he supported in the parliamentary election. Or maybe the members of the alliance did not believe Babayan’s suspicions or doubts or were reluctant to become involved in such statements on Artsakh? Interestingly, the Republicans who are so concerned about the future of Artsakh and Armenia are silent when there was a very specific statement that the leader of their party and then the president of Armenia went to Artsakh to inform about concessions. At the same time, the new thing in Babayan’s statement is that the issue was on the agenda until 2017. And Serzh Sargsyan, as any other former president of Armenia, was ready for concessions or so-called compromise, as he confessed after the four-day war in April, revealing the Kazan plan. Of course, his fellow party members may say that it was such a tactic. 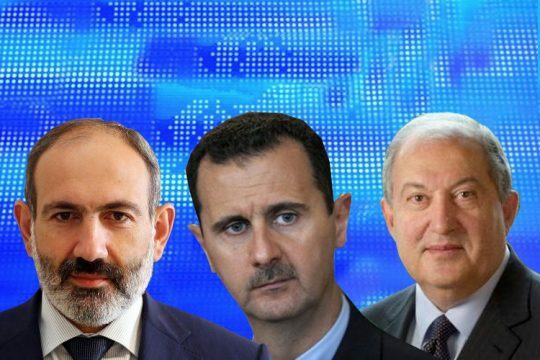 Of course, they may but that will complicate further deliberations on Nikol Pashinyan’s steps, it will not be possible to blame him for something they excuse Serzh Sargsyan for. The same goes for the people who used to be in Kocharyan’s wing of the former government. After all, Kocharyan also discussed return of territories, and the principles of Madrid were accepted as basis for talks during his office. Kocharyan could also say the tactic was such. The question is that such tactics gave Azerbaijan the right to war, and the heavy load of tackling the consequences of this tactic of the former presidents of Armenia. This tactic continues to date. Now it has become a domestic tactic, different sources have appeared which are tolling some suspicious process and a looming war in Artsakh, trying to cause lack of confidence in the policy of the new government. Nikol Pashinyan has stated that the government is conducting a policy on Artsakh which is not similar to any president’s policy. There are visible signs of it. Nikol Pashinyan said the Armenian side cannot be the primary addressee of the conversation about comprise. A situation which resulted from the policy of the former presidents. Earlier Pashinyan had made the core statement, later reiterating that he has no mandate to negotiate on behalf of the Artsakh government and the public of Artsakh has its government. The point is that this statement is intended for not only foreign but also internal addressees. Thereby Nikol Pashinyan not only makes the first step away from the principles of Madrid but also takes the first step towards shaping the principles of internal responsibility for Artsakh, blocking the path of the former tactic when groups which have problems with each other or the government took the issue of Artsakh into their hands, without a specific responsibility. Prime Minister Pashinyan brought up the issue in Cologne more deeply, during his meeting with the local Armenian community, saying that aside from the primary responsibility of the government for the issue, a pan-Armenian understanding must be defined and served by the institution of individual responsibility of each citizen, to ensure that instead of apocalyptic expectations the Armenians have a defined strategy and tactic on Artsakh with a multi-layer responsibility for it. In this context, it is no longer a priority who, when and where spoke or tried to push forward concessions. The priority is who and how understands the issue of Artsakh and what principles and logic of solution is there. For the time being, of the wide array of subjects that aspire to a political role in the life of the public and in government only ARF General Assembly has made a statement containing responsibility.